This a few months late, but here it is anyway! The story of my eighth National Novel Writing Month (NaNoWriMo). It was a crazy time. Some things went well; some did not. Enough spoilers! Let’s get to it. Just before the beginning of November, I had a big change at work. I won’t go into details, but there was a situation and I got moved into a different team to help clear it up. The timing was not ideal, to say the least. It was a lot of work, a heap of stress, and a drain on my mental space and energy (which I have talked about elsewhere). My day job pays the bills and I actually really enjoy it (most of the time). More and more, I’m grateful to have it. And I enjoy the challenges that it throws at me. I just wish it wouldn’t do it at an already crazy time of year for me! 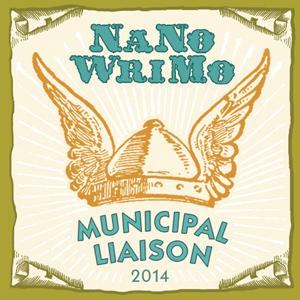 NaNo means a lot of ML (Municipal Liaison) work for me every year. We (my co-ML and I) try to do something new and different every year, to keep things fun and fresh. Part of what we organise is a huge Kick-off Party, which we decided to change up this year to be indoors, at night, and extend past midnight to include a midnight writing start when November 1st ticked over on our clocks. Another part is a Writer’s Retreat in which we take 20-ish people to a tropical island for a weekend, and feed them at least once (the rest they do for themselves!). So when I say that I was struggling with the weight of organisation, coordination, stress, work, play, and writing, you have an idea of what I mean. It’s a bit like juggling cats sometimes. It’s probably no surprise that I got sick in the first week of November (thank goodness, it was just a cold, but still). On the plus side, the new-style KoP went down really well. We had a turnout that exceeded our expectations (and the KoPs from recent years) when over 70 people turned up, and we had about 35 people stick around for the midnight writing start (we had expected maybe 20!). We ran out of the goodies we give away, which never happens, and we were utterly delighted with it. The feedback we got was all pretty positive. We’ve got some ideas about how to improve it in 2015, and we’re looking forward to that. Gotta love the big turnout! This year will be our last chance to have a weekend midnight start for a while, so we’re going to make the most of it. The other big feature of last year’s NaNo was our Writer’s Retreat. It was our third one and we’re getting better at it every time. Surprisingly, though, our attendance is dropping off every year. I say ‘surprisingly’ because we get nothing but overwhelmingly good feedback about it. People come and enjoy themselves, and they tell everyone about it. There are always niggles and edge cases, of course, but I think it’s safe to say that our Retreat is a jewel in our NaNo crown. Some parts of the Retreat highlighted an interesting phenomena between the MLs and the writers. As MLs, we make a point of being friendly and welcoming to everyone, and we like to keep our events as casual, comfortable, and open as possible. Most of our people are pretty relaxed around us. Some have become friends that I see outside of our writing events. However, when organising and running something as intense and involved as a Retreat, we can’t be as easy and casual with our people. We have to be responsible for the group in a way we aren’t usually, and as organisers, we have a lot more to deal with. We have to juggle the venue’s requirements, potential legal issues, catering, the schedule of events for the whole weekend, health and safety, any special requirements and situations that our attendees bring with them, and the time and effort it takes to get ~20 people where we need them to be at any given time. We set things up in a way we know will work and provide the best experience for everyone. With so many moving parts, even a small spanner in the works is annoying, though we do our best to paper over the cracks and not let it show. We want to make sure that people have a good time and don’t go home remembering that one thing that went wrong. We have very few rules and requirements on the Retreat, but the few things we ask our attendees to do, we try to make clear. Most people get it. Some decide that it’s optional and do whatever they feel like. In a few cases, people did explicitly what we asked them not to. I won’t go into details, but I will say that this caused us a few problems, and my co-ML and I ended up with a heap of extra work over the weekend. For the most part, this behaviour was inconvenient and disrespectful, and we dealt with it quickly and quietly. In one case, we had to cover up a particularly bad stretch of behaviour and were only partially successful. I think what’s most frustrating is that most of it was completely avoidable. Coming to talk to us is always the easiest solution, and we make a point of being approachable and willing to help. Had we known about the issues, we could have sorted them out, but by the time we knew about it, all we had left to us was damage control. For the most part, simple consideration would have prevented it all. We dealt with it all as best we could, and on balance, it was a pretty wonderful weekend. Most of it went well, and I love my awesome group of people. We had a roleplaying session one evening, and I hadn’t laughed so much for so long in ages. What does all this mean for the future of our Retreats? Hard to say at this point. I learned a few things over this Retreat and I would hate for these things to happen again, but I see it as a learning opportunity to take forward. We will need to change a few things to make sure the ripples and disruptions don’t happen again, and that’s fine; we’re constantly refining what we do to make sure everyone has the best time possible. The rest – the negative stuff – can sit in the past and stay there. Future Retreats are going to be determined more by interest, cost, and attendance than anything else. We had so few people in 2014 (19, including me and my fellow ML/organiser) that we actually lost money on it. Luckily, we managed to mitigate it so we weren’t out of pocket (and didn’t have to ask people for more money), but it’s not a good sign. We did a quick poll on why people didn’t come, and money was pretty much the top reason. We keep the Retreat as cheap as we possibly can, having attendees share rooms and so on, and our venue gives us a great deal. Times are tight for everyone, though, and the demographic of our NaNo peeps isn’t one with a lot of disposable cash. As cheap as it is, most of our people simply can’t afford a weekend away. This led us to start thinking about alternatives, because as much as everyone loves the Retreat, there’s no point running it if we can’t make it viable. We’re looking at options and have a couple of ideas. It might be time to try something different. My own writing for NaNoWriMo didn’t start very smoothly. Starwalker was troublesome and I headached about that for a few days. After a friend’s advice, I did the thing I had tried so hard not to: I put the web serial on hiatus and took a break from it. In hindsight, it was the right decision. In short: it was exactly what I needed at that particular time and place in my writing. During NaNo, I wrote 50,000 words of something else instead! Once I got focussed and moving on Vampire Electric, my steampunk paranormal mystery adventure romance novel (no, I don’t know exactly where to classify it yet, but it’s definitely all of those things), my writing picked up. I’m currently working on the second draft, so it was a pretty easy write: the first draft let me know what I wanted the second one to be. I’m really pleased with how that redrafting went. I hit my wordcount target with a few days to go, and I’ve reached the approximate mid-point of the book. (Looking at the full wordcount of the novel – as I did a chunk of it last NaNo too – it’s currently sitting at just over 100,000 words. It’s only about halfway done. I’m a little nervous of how long it’s going to be when it’s finished, but it’s gonna be a hell of a ride!) I hope to get back to writing it at some point, though that might be next NaNo’s job. Who knows? That’s the rundown! I can’t believe it has taken me so long to pull all of this together. 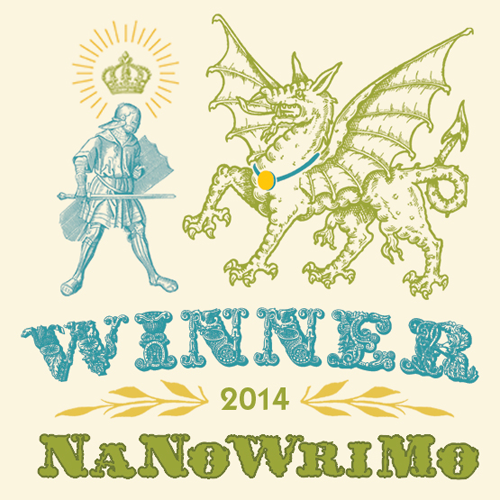 It’s about time to turn my attention to the planning of the 2015 NaNoWriMo fun, so it’s handy to look back now. I do love my writing peeps. They’re a wonderful group of people who help and encourage each other, with ease and laughter. The cast changes slightly every year – sometimes it grows, sometimes it changes – but it’s always a great thing to be a part of. I’m lucky and looking forward to the next one.